The exhibition of the young Azerbaijani writer and photographer Rustam Huseynov "The Heart of the Urals" has opened in the Russian Information and Cultural Center (RICC) in Baku. The exposition tells about Russian`s Perm region - its nature, architecture, culture, history and modern life. Most recently, the author visited Perm within the framework of Rossotrudnichestvo's New Generation program, Trend Life reported. The head of the Rossotrudnichestvo representation in Azerbaijan addressed the event. "We are grateful to Rustam for his initiative, and when he showed us his photos, it immediately became clear that many visitors to our center should see them," he said. 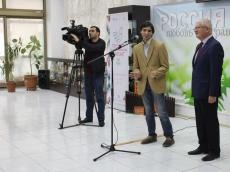 The architect and artist Elchin Aliyev and the science fiction writer Alexander Khakimov gave a high appraisal to the works included in the exposition. Rustam Huseynov personally conducted an excursion around the exhibition. He told visitors about the history of one or another of his photographs. At the same time, the author demonstrated deep knowledge in the field of wooden architecture, the sights of Perm and its nature. The exhibition will last until November 10. Admission is free.